Ellyse Alexandra Perry is an Australian sportswoman who made her debut for both the Australian cricket and football teams at the age of 16. She played her first cricket international in July 2007 before earning her first football cap for Australia a month later. Perry is the youngest person, male or female, to represent Australia in cricket and the first Australian woman to have appeared in both cricket and association football World Cups. Perry was fast-tracked to make her One Day International (ODI) debut for Australia against New Zealand before playing a single match for her state New South Wales in the Women’s National Cricket League (WNCL). In 2007–08, she made her debut for New South Wales and won the WNCL with them, and at the end of the season, she made her Test debut in Bowral against England. During the season, she was the player of the match in her Twenty20 international debut against England, and made her maiden ODI half-century against New Zealand. Perry took 4/23 in the final of the 2008–09 WNCL to help New South Wales defend their title. She then took nine wickets as Australia came fourth in the 2009 World Cup held in Australia. She was ineffective during the 2009 ICC Women’s World Twenty20 in England, taking only two wickets in Australia’s four matches. In 2009–10, Perry took 22 wickets and scored 148 runs as New South Wales won the WNCL again. She then took 18 wickets in 10 ODIs against New Zealand at the end of the season, as the Australians won all the matches. During these matches, Perry took her maiden five-wicket ODI haul. Perry played in each of Australia’s matches at the 2010 World Twenty20 in the West Indies, taking 3/18 and being named player of the match in the final as Australia defeated New Zealand by three runs to claim the title. A defender, Perry represented Australia at the 2008 Asian Cup, and scored in one of the matches. She played for the Central Coast Mariners in the Australian W-League during the 2008–09 season, before transferring to Canberra United the following year. In June 2010, Perry began her media career by hosting the football-related show Football Stars of Tomorrow, screened on the digital sports channel One HD. Perry was born in the Sydney suburb of Wahroonga and attended Beecroft Primary School and Pymble Ladies College, completing year 12 in 2008. At Pymble, she was Sports Captain, Athletics Captain and Cricket Captain. She is currently studying economic and social sciences at the University of Sydney. Perry is a regular on the Triple J breakfast show with Tom Ballard and Alex Dyson to present her segment “Perry Good Sports Woman”. 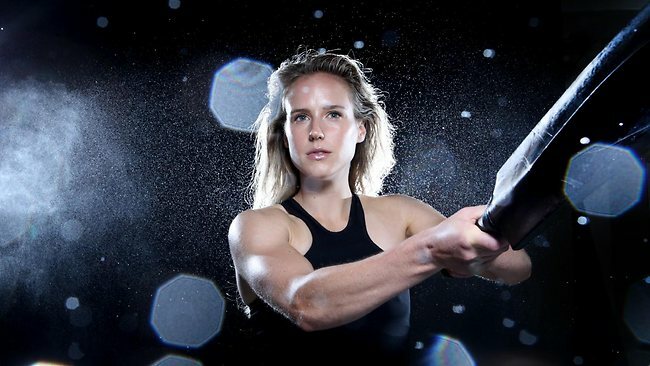 In 2013 Perry was ranked by SportsPro magazine as the 36th most marketable sports person in the world, and the most marketable Australian athlete. In cricket, Perry is an all-rounder who bats right-handed and bowls with a right-handed fast-medium action. Perry had a rapid rise into the Australian team. Soon after turning 16, she played for New South Wales in the Under-19 interstate tournament in January 2007. Perry was part of the 2010 World Twenty20 winning team in the West Indies and played in all of Australia’s matches. She was the player of the match in the final. Perry was in the Australian team as opening bowler that won the 2013 ICC Women’s Cricket World Cup in Mumbai, India. In 2013 Perry played a key role in Australia claiming the ICC Women’s World Cup in India in 2013, despite suffering from an ankle injury. She finished with 3-19 in the final, claiming the scalps of the West Indies’ top three batters. In football, Perry plays as a defender. She played her first match for the Australian national team, an Olympic qualifying match against Hong Kong at the Hong Kong Football Club, on 4 August 2007. She played this match at the age of 16 years and 9 months, and less than two weeks after her international cricket debut. Perry scored a goal in the second minute of the match as Australia won 8–1. As of July 2008, she has played eleven matches for the national team, including five in the 2008 AFC Women’s Asian Cup, where she scored a goal against South Korea. She has also played three matches for the Young Matildas, the Australian youth team. Perry was part of the Sydney FC squad that competed at the 2013 International Women’s Club Championship which comprised women’s football clubs from Europe, Australia, South America and Japan. Perry played in both of Sydney FC’s games. Sydney FC defeated the Japanese Nadeshiko League’s runner-up NTV Beleza 1-0. Both cricket and football are keen to retain Perry in their sport. She has accepted in interviews that she will probably one day have to choose between them, but for the moment she is pursuing both. 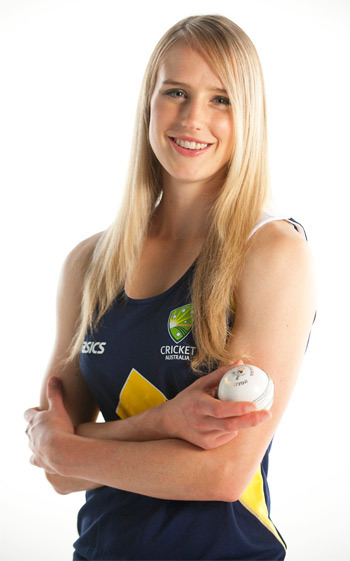 In 2010 Perry was faced with the decision whether to play for Australia at the ICC World Twenty20 or at the 2010 AFC Women’s Asian Cup which overlapped, of which she choose cricket.